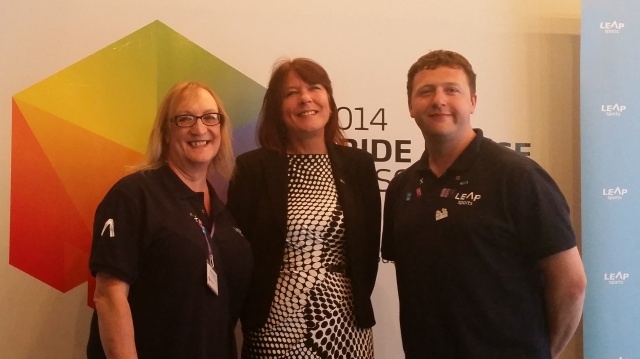 Earlier this week, Mary Fee MSP led a Members Discussion on Tackling Homophobia in Sport. She paid tribute to campaigners and organisations making mention of LEAP Sports and her visit to Pride House Glasgow within her opening remarks. LEAP Sports welcomes this very important issue being opened up in the Scottish Parliament yesterday and commend Mary Fee MSP for bringing this on to the agenda. It was heartening to hear many of our politicians sharing their positive views on tackling LGBTI based prejudice in sport. The discussion which can be watched in full here highlighted many of the very important current issues relating to LGBTI people's exclusion from sport. In particular the very important issues of attitudes within physical education and school sports, and the experiences of LGBTI women in sport were strongly highlighted. MSPs can continue to develop their understanding of these issues through engaging with organisations on the ground, and to discover some of the work which is being done in relation to tackling LGBTI-phobia, supporting improvements in the education experience and work on culture change across the whole sports system. LEAP Sports will continue to provide training, policy, advice and guidance to the sports sector on these issues. Our Football v Homophobia strategy offers a whole system approach to working within football, and through our Manifesto for Inclusive Physical Education we will continue to work with schools to support improvements in inclusion of LGBTI young people. We are also committed to making better use of the National LGBTI Sports Coordinating Group as a mechanism to lead a strategy of change and to join up work together in this area. LGBTI people should not be treated as a homogenous group as experiences for each identity is very different. In particular, the barriers, needs and experiences of trans, intersex and non-binary people accessing sport have some very specific and complex factors which systematically exclude those groups from sporting participation and competition. We therefore recommend widening this discussion to LGBTI prejudice rather than narrowly focusing on homophobia, and we would expect to take a greater look at access to participation and competition for trans, intersex and non-binary identifying people. There are some very direct opportunities coming up through the review of the Gender Recognition Act and through the review of the Sports Council Equality Guidance where MSPs can engage with these issues and take action to effect change. Picture shows Mary Fee visiting Pride House Glasgow in 2014 to meet with volunteers. Written on 22nd September 2017.